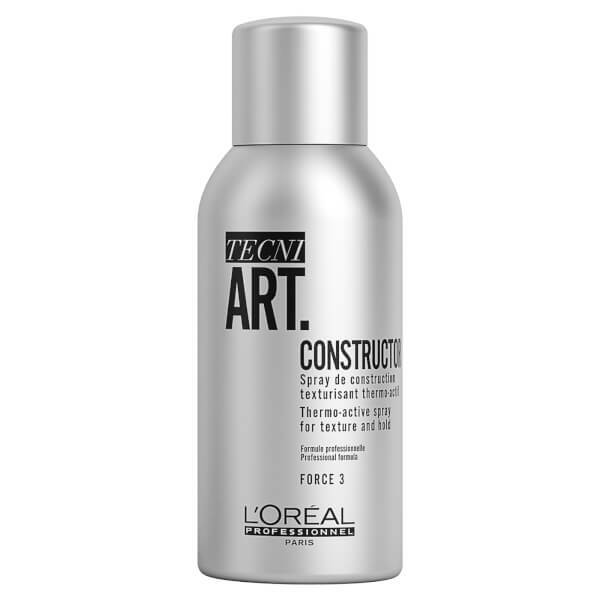 The L'Oréal Professionnel Tecni.ART Constructor is a heat-activated spray for adding texture and flexible hold to your hair. Perfect for creating voluminous and wavy hairstyles, the thermo-active spray adds texture and volume to fine hair whilst providing heat protection during heat styling. Spray abundantly on dry or wet hair. Style or dry with a hot tool. Aqua / Water, Dimethyl Ether, Alcohol Denat., Polyurethane-6, Bis-Peg/Ppg-14/14 Dimethicone, Polyacrylate-3, Aminomethyl Propanol, Dimethicone, Linalool, Limonene, Hexyl Cinnamal, Sodium Lauryl Sulfate, Hydroxycitronellal, Benzyl Salicylate, Benzyl Alcohol, Citral, Citronellol, Parfum / Fragrance. C213425/1.